Here at the Free Genealogy Tools blog, we're usually seeking out large databases where you can search family history online, for free. But today, something a little different... a nicely organized and sort of lovely visual aid to effective genealogical research. Mark Tucker, who runs a nice site over at ThinkGenealogy.com has put together a visual chart that lays out the research process to use as you try to discover family relations in the past, and just as importantly, as you document your discoveries and insure that you have credible information. 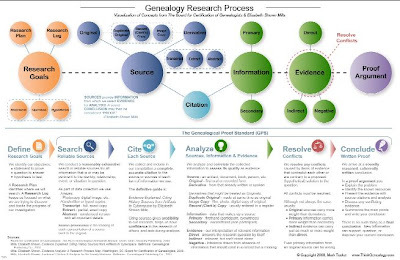 The chart itself, the Genealogy Research Process is based on concepts laid out by professional genealogical certification programs. At 9+ MB, it's a sizable download, so be prepared. But this is a PDF worth having, and maybe even printing out and sticking up on the wall.